Bears in the Air has taken off once again at the South Bend International Airport. On Wednesday, the airport launched its annual campaign, collecting teddy bears to donate to children in area hospitals, including Spectrum Health Lakeland in St. Joseph, for the holiday season. On hand to donate the first bears were the South Bend Cubs, along with their mascot Stu, and representatives from the airport. 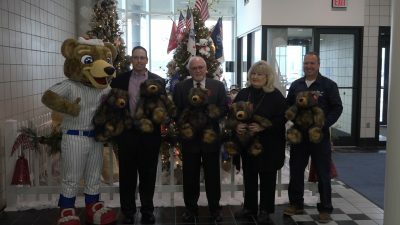 “To give bears to children who have to be in the hospital over the holidays is just a nice thing, and I know it makes those kids very happy and surprised,” said David Sage, president of the St. Joseph County Airport Authority Board of Directors. The South Bend Cubs say they want even more people to donate this year than in years past, and will match the first $1,000 donated toward the program. The airport is hoping to donate over 2,000 bears this year. Donations can be made at the airport through December 17. An official kickoff party open to the public will be held Friday night at South Bend International. A $15 entry fee will provide a bear and a donation to the Robert L. Miller Sr. Veteran’s Center in South Bend.